Selling | What The Sooke? Is this the year you buy your first home? Get educated about buying and selling real estate. Hear from three local experts about buying your first home, moving up, and more! I’ll be joined by Sooke’s dynamic mortgage team, Kerry Reid and Kari Stauble of DLC Modern Mortgage group. Our seminar will be a fun, interactive, and informative evening, arming you with the tools to bring your real estate goals within reach. 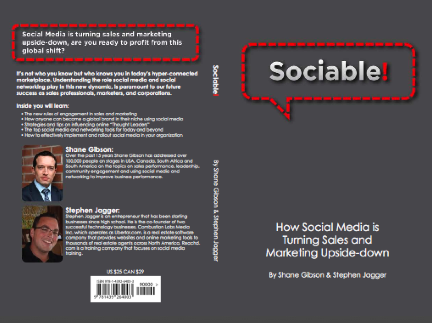 This Thursday, April 29th, 2010, Vancouver-based entrepreneur Stephen Jagger and professional sales trainer Shane Gibson will be at the Downtown Victoria Chapters store to launch their new book, Sociable! How Social Media is Turning Sales and Marketing Upside-Down. The event starts at 5:30 with a networking opportunity for social-media-curious businesspeople, and then a presentation from Steve and Shane about social media and the unique way they wrote the book. Q&A will follow, and Shane and Stephen will sign your copy of the book. If you’re interested in learning how social media can help your business, I’d highly recommend you attend this event and pick up a copy of the book. Many of the ideas and methods they teach I have used to build my business, and in today’s business world, it’s not acceptable to answer “What’s your social media strategy?” with a blank stare. I’m pleased to announce that I will be teaching web marketing and social media training in Victoria, BC starting next month. Reachd.com has approached me to be their Victoria instructor. The 3-hour classes are taught in the afternoon, and are ideal for anyone in any small business who wants to learn how to capitalize on this growing trend. How can you effectively use social media and web marketing to grow your business? I can’t wait to show you how. The three courses that are happening next month are: Social Media Guided Tour ($149), Explode Your Growth With A Blog ($149), and Broadcast Your Message With Online Video ($249 – includes a video camera!). You can take all three courses for $399 – a savings of $149. Come out and learn something in December and be ahead of your competition in the new year! The courses will also be offered in January, along with courses on Search Engine Optimization (SEO) and Google AdWords. Call your REALTOR®, and list it now. Of course, not every home is going to sell overnight, but supply of good, moderately-priced homes is tight, and seems only to be getting tighter. I’ve been tracking listings of single family homes in Sooke, Langford, and Colwood for a client of mine. Check out this spreadsheet (I’ll keep updating it, so feel free to bookmark it). Listings are up a little bit this week, but often conditions come off on Fridays, so you can expect quite a few drop off before the week is out. From a days on market standpoint, I’m simply amazed at how quickly well-priced, mid-market homes are selling. Out of all sales (80 total) in Langford, since September 1, the average time to sell is 36 days. There were a few 100+ days on market listings that drag the average up a little. To better illustrate my point, there were fully 32 single family homes that sold in 14 days or less. Keeping in mind that conditions on an offer usually take a week or longer, you can comfortably assume that homes that sell in 14 days or less have an accepted offer within a week. During the same period, it seems that most of the core areas of greater Victoria are experiencing similar time to sell. Next door, Colwood had an average of 45 days on the market, with 31 sales. The central core of Victoria (Victoria, Saanich, Esquimalt, Oak Bay) saw 307 homes sell in an average of 36 days. Interestingly, Sooke, which has much more moderate prices, had 36 sales in an average of 76 days on market. This is not unexpected – Sooke’s market has always been a little slower than the rest of greater Victoria. Still – well priced, mid-market homes are selling quickly in Sooke. At a time of year when things are usually expected to start slowing down, this market is as busy as ever. If you’re thinking of selling your home, now would be a very, very good time. There is still time to move before Christmas, or start the new year off in a new home. I’m always available to answer questions, run stats, and of course I’d love to evaluate your home and show you my marketing plan. I can be reached at 250-885-0512, Tim@TimAyres.ca, or you can fill in my contact form. Could this be your next home? I will be co-hosting a series of real estate seminars on Thursday, June 11th at the Juan de Fuca Library, beside the rec centre on the Island Highway. Joining me are Alexis Mills, a mortgage broker, and Jeremy Kimm, a financial planner, for three different perspectives about buying and selling real estate. We have two seminars planned for the evening. You can attend one or both, depending on your needs. Tim Ayres – Royal LePage Coast Capital Realty: Tim has a unique approach to real estate, and offers sound, impartial advice to all clients, coaching them along every step of the way. Tim’s no-pressure approach makes his clients feel at ease, empowered, and confident in their real estate transactions. Alexis Mills – Global Mortgage Corp: Alexis is a true professional in the mortgage world, offering her clients outstanding service and the best rates, bar none. Alexis works incredibly hard on every mortgage, ensuring her clients are matched with the best mortgage product in today’s ever-increasingly complex world of mortgage financing. Jeremy Kimm, CFP, FMA, Financial Consultant, Investors Group Financial Services Inc.: Jeremy has an enthusiastic, yet straight-forward approach to financial services. From life insurance to long-and-short-term investment planning and more, Jeremy’s friendly deameanor and expert knowledge enables his clients to ensure they have the most effective financial plan going forward. 6:45-8:00pm at the Juan De Fuca Library: Upsizing, Downsizing, Investment, and Vacation Properties. Join us for an informative look at moving up or moving down in the Victoria real estate market, purchasing an investment property, and purchasing a vacation property. You’ll learn about buying and selling strategies, mortgage requirements and innovations to help you save, and about the potential tax consequences and how to avoid them. 8:00-9:00pm at the Juan De Fuca Library: Buying Your First Home. First time buyers drive the real estate market in most areas. They allow the move-up buyers to move up and have been instrumental in kick-starting our real estate market in recent months. How can you take advantage of record-low interest rates, falling real estate prices, and government incentives to purchase your first home? What are the steps involved? How can I save a down payment? This very popular seminar has helped many first-time buyers get into their first homes in the past few years. You can attend both seminars if you wish! It’s been a while since I was on video! I went to the West Shore MLS tour in Colwood and Langford today and just thought I’d say hi to you through the video. I had one of my listings on the tour this week and got to see 10 other really nice places in Langford and Colwood. I hope you’ll enjoy the video! Listings are up. WAYYYY up. Sales are down and prices are flat or falling. What does this mean to you? If you’re a buyer: Good news. If you’re buying now you’ve got more inventory to look at than any time in the last twelve years. Shop around and make offers. Sellers are probably nervous. If you’re a seller: Not so good news. While prices for single family homes have remained relatively flat over the medium-term (the six-month average is still near $600,000), the average price dropped to $550,000 from $578,000 last month. Realistic pricing (listen to your agent!) and good marketing is key to success in this market. Sales of homes and other properties in the Greater Victoria area followed the expected trend and softened last month as many people enjoyed vacation time. Prices also moderated slightly. A total of 517 homes and other properties sold in August through the Victoria Real Estate Board’s Multiple Listing Service® (MLS®) compared to the 616 sales in July. There were 846 sales in August of last year. Victoria Real Estate Board President, Tony Joe, notes that today’s buyers now have more properties from which to choose than at any time since 1996. “The number of properties available for sale is now at the highest level in over 12 years, increasing in August to 4,657. That represents a 39 per cent increase compared to August of last year.” Joe notes that prices moderated last month with nearly 46 per cent of single family homes selling for under $500,000. “The average price of single family homes in Greater Victoria last month was $549,914, down from over $578,000 in July; the six-month average was $592,582 though the median price in August was considerably lower at $512,000.” Joe noted that eleven single family homes sold for over $1 million in August, including two sales on the Gulf Islands. The average price of all townhomes sold last month was $413,994, down from nearly $455,000 in July; the six month average was $435,309. The median price in August was $382,000. Joe noted that the overall average price for condominiums at $302,200 last month was virtually unchanged from July. The average for the last six months was $319,825. The median price for condominiums in August was $280,000. MLS® sales last month included 269 single family homes, 160 condominiums, 53 townhomes and eight manufactured homes. An issue that comes up every now and again is the practice of certain real estate agents cancelling a listing that has been on the market for a while and re-listing it right away. The result is a new MLS® number (they are sequential), and a days on market count set to zero, making the listing appear “fresher” than it is. Watch the video below, and comment using the form/link below the video. Deceptive Marketing by REALTORS® using Days on Market from Tim Ayres – REALTOR® on Vimeo.